Limited is a decent product if you enjoy boom or bust boxes and are eager to rip a basketball product outside of Prestige. Each 7-card box delivers 3-hits on average and carries a price point of around $100. Limited is one of those products that is extremely hard to review due to the fact that each box contains a single pack. If you enjoy cutting straight to the hits and numbered cards, Limited is definitely worth a look, I just highly recommend that you put a great deal of thought into that look before jumping for a box. Limited is the type of product that you might be better off just buying the card(s) you want rather than attempting to pull them yourself. The biggest problem I've always had with Limited is that the card design is easily confused with Certified, which is a far less limited product. The product's foil board design remains intact per usual, which is either a good or bad thing depending on your opinion of Limited's card design. The patches are extremely hit or miss, the Jumbo Patches look more event-worn than game-worn. The prime patches look awesome but are much harder to come by. The photography can get downright weird at times, some of the pictures used on the Jumbo Patch cards look like mugshots and not in humorous way, which I would have enjoyed, who doesn't enjoy funny card photography. The checklist is extremely brief, but hits on all the year's key rookies, veterans and a handful of retired legends. The non-relic, non-autographed insert cards are frustrating. I would rather have a deeper base set that incorporates numerous themes than a host of inserts that aren't very collectible. For rookie auto chasers, all the big names are present including Wall, Cousins, Turner, Favors, Johnson and beyond. Like any boom or bust product, the value can range from a 1/5 to 5/5. 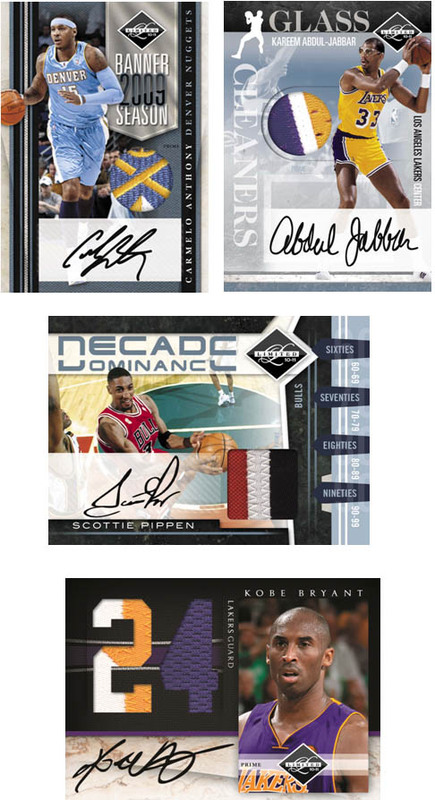 The primary value in Limited can be attributed to the fact that it is only the second NBA licensed product of the 2010-11 Basketball Card Season. At the moment collectors are a bit "Prestiged" out, so Limited's value is pretty decent, but as with last year, two months from now that will change drastically due to the availability of more diverse and intriguing products. As I noted above, you'll love or hate Limited based on the box you get. My box was pretty decent, so my enjoyment level could be described as somewhere in between buyer's remorse and extremely enjoyable. Ultimately, if you are a huge basketball fan who is a big fan of Limited, you will enjoy it. Conversely, if you've never enjoyed Limited, there's nothing strikingly fresh enough to change that. Greg Monroe 2010-11 Limited PRIME PATCH Auto Rookie # 10! Boston Celtics! HOYAS! Each 2010-11 Panini Limited hobby box contains a single 7-card pack with a total of 3 hits, providing the predictable moderately high risk vs. reward proposition. Limited is a product that cuts straight to the hits, so if you suffer from base card overload, I would definitely look into Limited come October. Here are the top 10 best deals on hobby boxes currently listed on eBay.